It’s Monday and I am diligently working on a new project at my job, when I receive a message from Monarch. “You comin’ home anytime soon?” asks my daughter. A second notification arrives: “I did some math.” At that point, it became clear to me that providing my child with electronic messaging was going to improve our communication. I had set up our new Monarch account for each of my children on the prior evening. My wife and I both work outside the home, so the convenience that Monarch provides can be important and helpful. 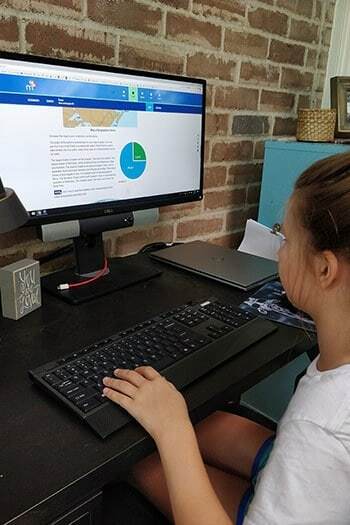 After using a book-based curriculum for some time, our children were thrilled to do their schooling on the computer. Experiencing Monarch as a curriculum alternative was interesting (and educational!). Less than five minutes later, I had added each student and assigned a year’s worth of coursework. I was impressed by the simple but personalized interface that enabled me to change how the website handled incorrect answers or which Bible translation was used. I elected to give immediate feedback on quizzes and tests; instead of merely receiving a grade at the end. The website suggested a grade percentage-to-alphabet grading scale but allowed me to easily raise or lower the percentage required to pass. Monarch appears to be a rigorous program that combines Alpha Omega Publications’ (AOP) reputation for academic excellence with a flexible online system. It strategically presents a wide selection of content with varying assignments that include essays, projects and games. We are a larger family, which brought some unique hurdles when using Monarch. I had one device to share across three children. For a family with one device for each student, Monarch works efficiently. Our family also works on a unique schedule that typically includes school on Saturdays, but not Mondays. For families that have a unique school schedule (such as school on Saturdays), using the automated system takes longer to set up. Each Saturday must be individually changed to a school day in order for the automated system to schedule tasks for that day. While my daughter enjoyed the technological aspect of Monarch, I was concerned about the amount of time that she would spend interacting with a computer. Would her education still be meaningful and have a lasting impact? Or would it simply become a period of boredom where she was required to click through digital pages without meaningful interaction? My conclusion is that it was a little of both. As a second-generation homeschool family, we prefer the old-fashioned school experience that our current book-based curriculum provides. 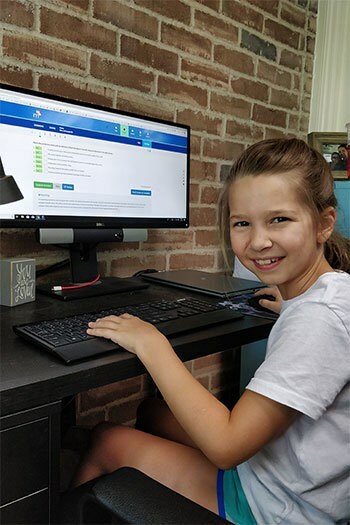 But for busy homeschool families who enjoy their students being self-taught and self-driven, Monarch may be the perfect fit. Monarch‘s curriculum covers all subjects (plus electives) for grades 3-12. Parents using Monarch don’t have to teach the classes. It is a great fit for the family who wants to have automated grading and a self-sufficient teaching program while not sacrificing a solid and rigorous education. To learn more about Monarch, visit DiscoverMonarch.com. We believe that homeschooling is the best education model. Did you find this review helpful? If so, share it with friends and sign up for email notifications for more encouraging articles. My daughter was homeschooled 1st-8th. She went to public school in Texas for 9th and 10th. She was wanting to go to community college for dual credit, but for too many details that didnt work. She started 11th grade and it has been a rough ride. What i need to know, and have ny hand held for this. I need to choose a curriculum that meets Texas criteria so she can graduate with all the Texas requirements (or more). Ann-Marie, I will email you additional information to help you get started. Texas allows you to choose the curriculum that works best for your daughter. Many people use a model similar to what the public schools might use, but you can tweak and customize her graduation plan based on what she needs after graduation. If college is in her future, check with the colleges that offer the degree plans she might pursue, and be sure you have offered classes that prepare her for that.